WASHINGTON (Reuters) - Hundreds of youngsters skipped school to rally in Washington on Friday as part of what organizers called an international youth climate strike to seek action on climate change. Chanting "climate action now! ", some 1,500 students joined the event in front of the Capitol Building, where Congress sits, while similar rallies were held in 46 states. The demonstrations, which demanded politicians take action to combat climate change, backed measures including the Green New Deal, an ambitious Democratic environmental proposal that has become a lightning rod for Republican criticism. "This is the only Earth that we have. There is no Planet B. There is no other place we can go so we need to save it," said Elise Haverland, a 16-year-old from Silver Spring, Maryland. Protesters carried colorful homemade placards bearing slogans such as "Our planet, our future," "Let us Live," and "Don't frack up our Earth." The students also held an 11-minute silence, one for each of the years that a United Nations report said the world has remaining to get climate change under control. School children across the world held demonstrations to demand action on climate change on Friday. The protests are the offspring of youth strikes in Europe that were inspired by Greta Thunberg, a lone 15-year-old picketer at the Swedish Parliament. 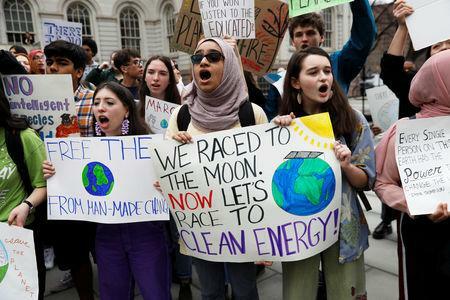 Organizers said they hope staging the event during the school day will signal the importance that students attach to fighting climate change. "Adults come fight with us!" 12-year-old Haven Coleman of Denver, one of three youth organizers of the protest in the United States, said from the stage.